This edition of Anti-Racist Art Reviewed looks at one of Charlie Hebdo's little productions. Who else? Trigger warning: many people find the image under discussion offensive. In fact, just to soften the blow, I'm going to give you a translation of the image into words first. Anne-Sophie Leclere, member of the racist Front National has said that she would rather see black Justice Minister Christine Taubira in a tree swinging from the branches rather than in government! 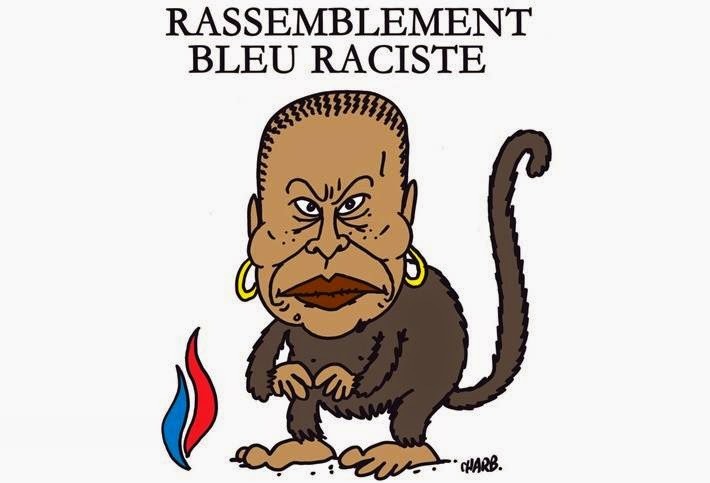 And that's after she caricatured Taubira on her Facebook page by comparing her photograph to that of a monkey. Looks like the Front National's 'Deep Blue Assembly' really is a 'Deeply Racist Assembly' after all. Color us surprised. Below the fold, you can find the image that says the exact same thing as the text above. There is the play on the Front National's slogan which denounces them as racist. There is the Front National's logo, attributing racist comparisons between Taubira and monkeys to the Front - even though it was Charb who redrew what they said, just as I repeated it above. Given the date, place and original audience of the drawing, it's reasonable to suppose that everyone who saw this image was capable of interpreting it accurately. All the same, the drawing caused controversy then, and even more over the last few days as Charlie Hebdo's work has come under wider, and heavily de-contextualised scrutiny. Was Charb's cartoon such a massive failure at anti-racist art that it's fundamentally and unavoidably racist? Maybe a few comparisons can shed light on the matter. Is there a significant difference between my written assessment of an incident in French current affairs and Charb's drawn one? Surely words are easier to decrypt and Charb's visual signs require more background. I obviously thought so. That's why I put my words first, in order to make the context obvious. It's also why I bothered to elaborate on Charb's iconography. My words are self-explanatory to anyone who reads English, if you don't get Charb's symbols, there is nothing in them that will give you much of a clue. In that case, what could you see but a racist image of an anonymous black woman with a monkey body, flanked by a symbol you don't recognize and some text in an unfamiliar language - whereas I expect you to read my text as a report of a racist incident OR fail to understand it altogether. The boundary between known and foreign language is more fuzzy for images than it is for words. All the same many of the cartoon's original viewers still responded to it as racist, even though they certainly knew it meant the same thing as my text. Is there a significant difference between Leclere's original imagery created to insult Taubira and Charb's drawing using the same imagery, created to mock Leclere and her party? Many of the original viewers responded as though there was not. It's as though, swept away by the emotional impact of the central image, they ignored all the details which told them what it meant. They couldn't or wouldn't parse the message. If so, this must lie in the nature of visual imagery itself. I'm convinced that a majority of those people would not similarly claim that what Leclere said, and a news outlet reporting what she said are equally problematic. Perhaps Charb's iconography was off. Any visual artist understands the importance of centrality and scale. He should have known that the cartoon composed as it was would overwhelm his viewers and that it does, according to the laws of visual representation, make the racist depiction of Taubira rather than the racism of the Front National its central theme. He could have made the Taubira image subsidiary and emphasized the Front National attribution - perhaps by locating it within a thought bubble emanating from some assembled Front Nationalistes. Then again, being Charb, he might not have bothered to do so if he thought about it. After all it was 'clickbait'. So yeah, maybe insufficiently cautious and responsible (I know!) in wielding the iconography there, Charlie-Hebdo. If the reproduction of images linking Taubira with monkeys is inherently racist, regardless of whether its being done by a right-wing nationalist party or a left-wing critic of said party, isn't it still racist when it appears in a blog post dedicated to reviewing anti-racist art? Well, I offered Charlie-Hebdo a get out clause. I suggested they could have got away with that image by de-emphasizing it, making it sufficiently subsidiary to the original authorship of the Front National and Charb's criticism of the FN, by presenting it in such a way that it couldn't overwhelm the viewer or even become the first thing s/he saw. And similarly, I hid the image in this post under a warning AND a fold AND caged it round in a sea of words. But the possibility still remains that for those who think the image is always and inherently racist - and there are some - this post is too. Something to think about, for all of us. Update: I discuss this image a bit more in the context of a piece of 'anti-sexism' satire by Newsweek.